More and more atheists are gathering the courage to express themselves publicly every day. Unlike what most believers claim, atheists are perfectly positive and happy-go-lucky people who happen to have a certain set of ideas that are either unknown to them or different from those shared by them. Wearing t-shirts with atheist symbols can prove to be so much more than a mere fun gesture or a hip style statement – it can help educate those around you and make people more aware about a highly misunderstood subject that is atheism. 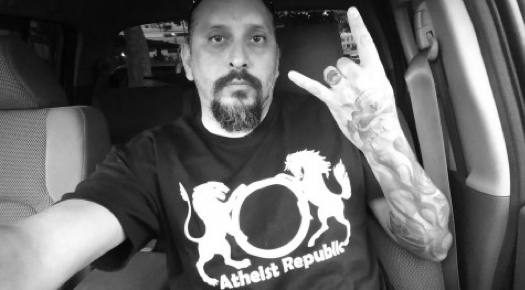 Thus, you and your friends should pick up a t-shirt from Atheist Republic’s store if you want to literally wear your heart on your sleeves and flaunt your faith or the lack of it to the rest of the world. Wearing such t-shirts can be the big leap that closet atheists have been waiting for all these years. If you think those around you misunderstand you, here is your opportunity to set things straight. Do your share to fit in and feel accepted and you will be pleasantly surprised at the way the world receives you. Once, you start facing up to those who are spiritually inclined and deeply religious, you will realize what you have to share has a lot of weight as well. At the end of the day, you alone determine your identity and people around you are obligated to accept you for who you are if they wish to be accepted by you as well. Choose from our gallery of umpteen designs to see which one best represents you and helps you stand out in a crowd. In fact, you could also present these t-shirts to your atheist friends to show support for one another. Remember that you are not alone – if you put in the effort to come out and express yourself, so will those around you.